Harvesting mushrooms from woodlands can provide a tasty and nutritious meal but you need to know what your are collecting because mushrooms can also be deadly poisonous. Our advice, go on a course or go along with somebody who knows what they are doing and has plenty of experience. A good book on the subject will help a lot too! 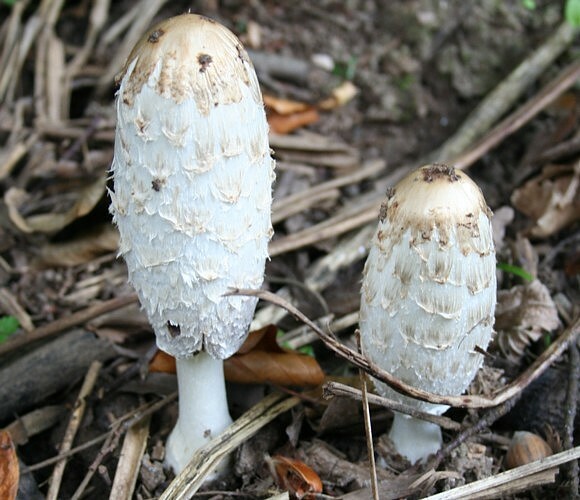 Another good one for eating is the Coprinus comatus or Shaggy Ink Cap. It’s a very distinctive fungus and is unlikely to be mistaken with any other. The cap is more a cylindrical shape, white with a creamy centre and covered with a shaggy white and pale brown scales. The stem is white and sometimes slightly pink. When this mushroom goes over it drips a black inky substance hence the name, so collect them when they are nice and young. They can be found between spring and autumn time among grass, compost heaps, rubbish dumps and open fields and gardens. They are also one of the best tasting mushrooms you can find in the UK. This is one of the most impressive looking toadstools in the UK. It is most commonly found on the trunks of ash and elm trees between spring and autumn. And is easily recognised from others by it’s ochre colour on top with dark brown scales and a white fleshy colour underneath. This one is also edible when it is young and although the flesh is fibrous and fairly soft it is also more or less tasteless. But if you were short of food it would make a good meal. Maybe a few local herbs would do the trick!